Spartan Band requires financial support beyond what is provided by the school district. We, the music department in cooperation with the Music Boosters provide fundraising opportunities throughout the year for both overall operations and individual student travel accounts. Please support these fundraisers! More information on fundraisers will be posted soon. Personalize the program with a special message for your musician(s) by purchasing a Shout-Out. Your one time purchase will display your message in all concert programs (band and/or chorus) throughout the current school year. Simply fill out the form and send it in to school along with $10. All proceeds benefit the MHS Music Department. 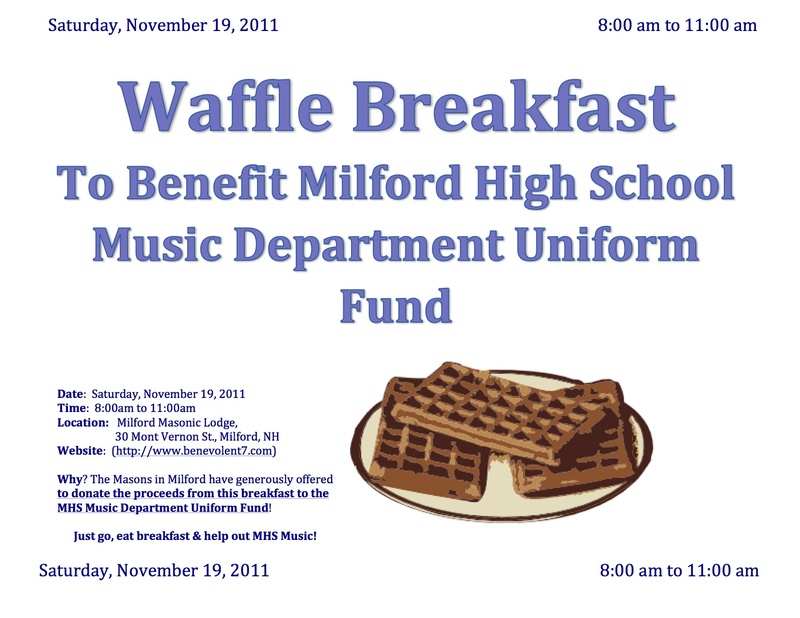 Checks can be made payable to Milford High School. Place your order with an individual music student to support their individual travel account. 10lb cartons cost $25 and 20lb cartons cost $30. Let us Deck the Halls! Profit reaches 70% when 350 cards are sold. Pizza card pays for itself with one use!! The pizza card entitles the card holder to receive one (1) free 12 inch one topping pizza when they buy one 16 inch Pizza of the World at Regular Price at FOODEE’S. You are invited to a “Flapjack Fundraiser” at Applebee’s in Nashua on Saturday Morning, December 8, 2012 between 8:00am and 10:00am. Mark your calendars and plan to join us for breakfast! James is starting to fundraise for his Boy Scout Eagle Project, which is going to benefit the MHS Music Booster association. He is planning to build an equipment transportation trailer for the MHS Marching Spartans (Marching Band). The fundraising goal for this project is approximately $4000, and as part of that process he has organized this “Flapjack Fundraiser” at Applebee’s in Nashua ( exit 8 ), on 12/8/12, 8am to 10am. We know that December is a very busy time, but we hope that you will come and have breakfast with us before starting your Christmas Shopping, or whatever else you have on your calendar for that day! We would love you to support this fundraiser by buying a ticket and eating a wonderful pancake breakfast cooked and served by the Applebee’s Staff in Nashua. $10/person and $8/Seniors & Children under 12. Tickets are required, and must be presented at Applebee’s on the day of the event. Thank you for considering supporting James in reaching his goal of being an Eagle Scout! All music students will be asked to sell four tickets for the music department. Proceeds will benefit the MHS Marching Band Uniform Fund. Tickets go on sale Monday, March 5th, 2012 and a winner will be selected on Friday, April 20th, 2012. For each additional ticket a student sells (above and beyond four) he/she will receive $5 profit to be placed in his/her student fundraising account. Students may use this money toward future travel or festival expenses. Thank you to our generous donors for making this fundraiser possible.